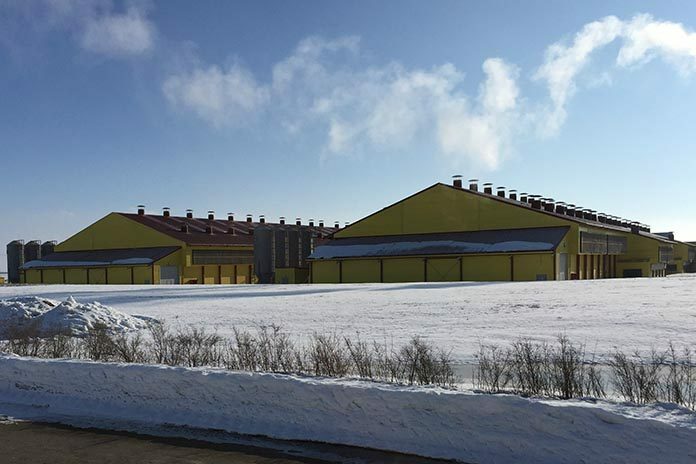 Most people think minimum ventilation in a poultry house is all about air quality but that is only partially correct. First one should define good air quality. Many people define good air quality as ammonia (NH3) concentrations of 25 ppm or less, carbon dioxide (CO2) concentrations of 5,000 ppm or less and carbon monoxide (CO) concentrations of 50 ppm or less. Minimum ventilation rates are not based on oxygen concentration. 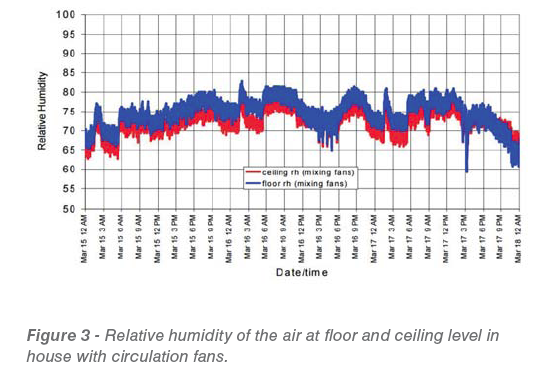 However, the main purpose of minimum ventilation is moisture control, which can be achieved by maintaining relative humidity (Rh) levels between 40 and 60%. NH3, CO2 and Rh concentrations are positively correlated, meaning that if Rh is high then NH3, and CO2 will be elevated as well (Figure 1). Maintaining Rh between 40-60% increases the probability that the NH3 and CO2 gases will be less. So maintaining Rh in this range is a good form of prevention. In many cases prevention is cheaper than having to correct a problem. For example, it is usually more expensive to ventilate a house enough to reduce high ammonia that it would have been to just prevent it with optimum minimum ventilation rates and litter treatments. Litter moisture will increase as the relative humidity exceeds 60%. Consequently litter quality deteriorates as litter moisture increases. Litter moisture can increase for a number of reasons which include but are not limited to increased bird stocking density, coccidiosis, necrotic enteritis, diet, inadequate ventilation, insufficient litter volume, and improper drinker management. Lousy litter quality leads to increased ammonia and increased numbers of bacteria including pathogens. Increased litter moisture also leads to increased incidence and severity of footpad dermatitis, which not only can be an economic loss but is also a factor considered in animal welfare audits. 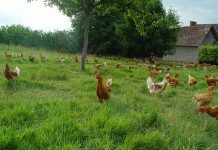 It is in the best interest of bird health, performance and welfare to strive for optimal litter and air quality during the flock grow-out period. Below are options that can be utilized to limit litter moisture accumulation and contribute to an environment that will allow the broiler to reach its full genetic potential. Whether it is fresh bedding or used litter a minimum of three inches is required. As bird density increases or if the farm has a history of litter quality issues, a litter depth greater than three inches should be utilized. The litter depth/volume will need to increase with bedding materials that do not absorb moisture as well such as peanut hulls and rice hulls. Typically, the bedding in houses that use these materials is deeper than those that utilize pine shaving or sawdust. Used litter, when properly managed and worked between flocks serves as good litter base but also has a smaller margin of error when it comes to managing for ammonia generation and Rh. 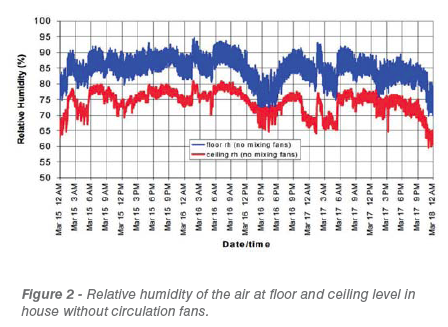 A circulation fan system is used not only to break up temperature and Rh stratification (Figures 2 and 3) and create more uniform conditions from one end of a house to the other but just as importantly is used to increase the level of air movement over the litter to aid in moisture removal. A proper circulation fan system moves air gently across the litter, producing air speeds generally in the neighborhood of 50 ft/min so as not to cause detrimental drafts on the birds. Circulation fans should operate continually to maximize moisture removal but may need to be temporarily turned off when the timer fans operate if they interfere with the air circulation pattern created by the air inlets. 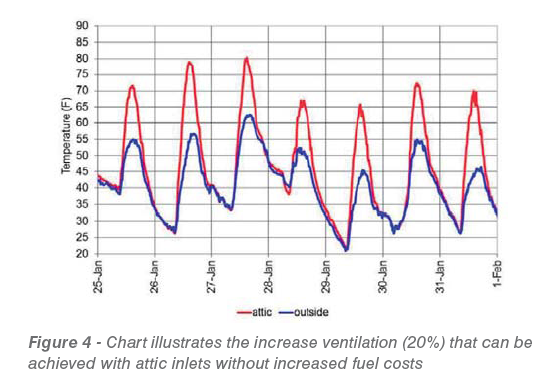 Though attic inlets can lead to slightly lower heating costs, the primary objective of an attic system is to maximize fan runtime, which will lead to improved air quality and litter conditions. Attic inlets tend to do a better job of conserving heat in a poultry house than conventional side wall inlets. First, fresh air is introduced at the peak of the ceiling where the warm air produced by the heating system and birds tends to collect. Second, air entering through an attic inlet moves parallel to the ceiling and not parallel to the side wall which tends to maximize the distance the air travels along the ceiling (Figures 2 and 3). The longer the air travels along the ceiling the more it will heat up and dry out. Last but not least, during the daylight hours, drawing heated air out of the attic at a minimum reduces house cooling and sometimes leads to increased house temperatures causing more fans to operate. The combination of all these factors has been shown to increase the amount of air brought into a house by 20% or more compared to a house using sidewall inlets (Figure 4). 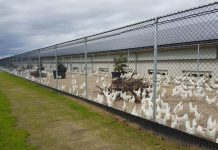 Keeping litter dry is a significant challenge in broiler houses. 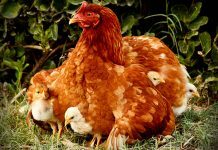 For every pound of feed a broiler eats it will drink roughly one quart of water, 80% of which will end up in the litter and the air in the house. 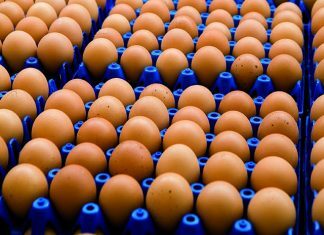 To prevent the buildup of moisture in the litter, producers must constantly exchange the moist inside air in a poultry house with the relatively dry outside air. If a producer can remove the same amount of moisture from their houses each day that the birds are adding, they can maintain a constant moisture level in their houses and problems associated with excessive moisture will be minimized. 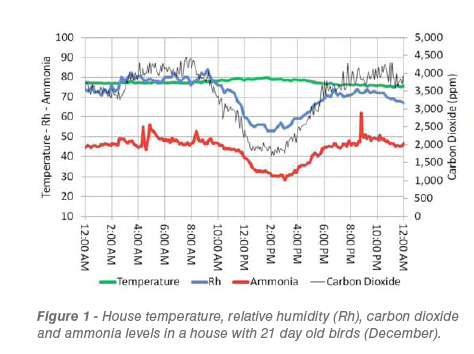 Recently an app titled “CHKMINVENT” was developed for the iPhone to enable producers to determine how much they need to ventilate their houses during cold weather to remove the moisture their birds have added on a daily basis. 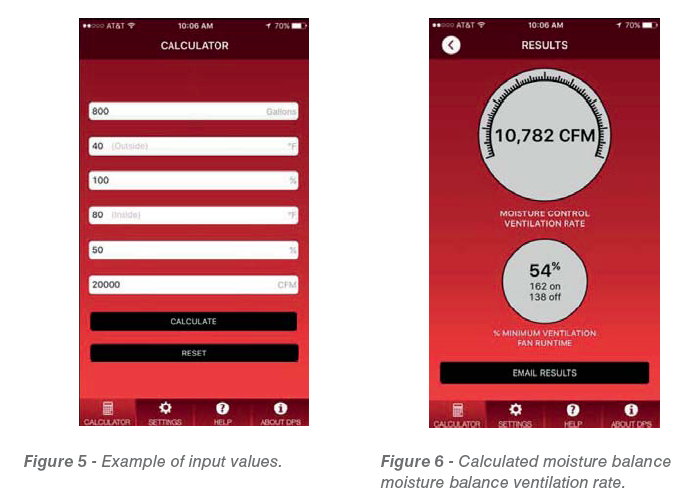 The app utilizes psychometric equations to determine the air exchange rate required to remove a user-specified amount of water based on inside/outside conditions (Figure 5). minimum ventilation fans runtime (% runtime as well as seconds on/off out of 300) (Figure 6). This app can be used to confirm whether ventilation rates currently being used are adequate to remove the moisture being added according to water usage by the birds. However, nothing is full proof so house conditions such as Rh and litter condition should continue to be monitored. A combination of the app, Rh and litter conditions can be used to fine-tune the minimum ventilation rates as needed. More information on the app and its use can be found by at: www.poultryventilation.com.